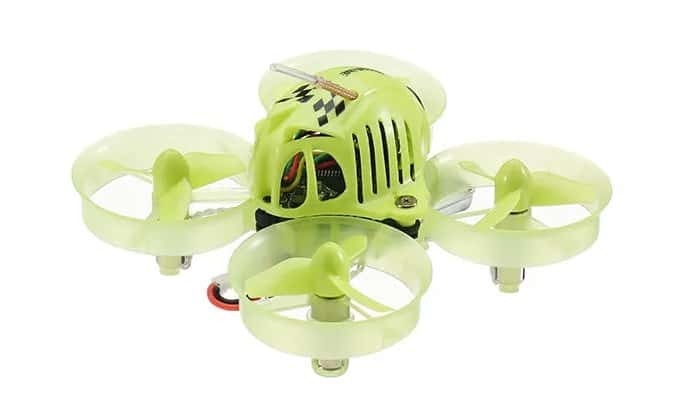 The QX65 from Eachine is part of the fun and interesting family of micro racer drones with a 65mm wheelbase and 26g in weight (with the battery). 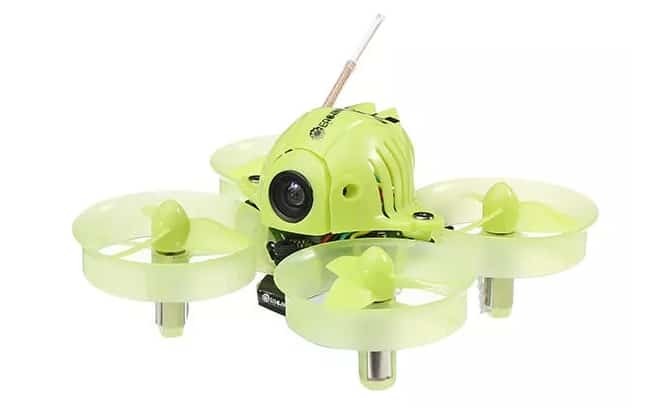 Now, even though it is small (it is basically an upgraded Tinywhoop), the quad packs a bunch of cool features such as the integrated Betaflight OSD, three different flight modes, and a CMOS camera with adjustable lens angle. Advanced – extra propellers, batteries, canopies and an advanced battery charger. Now, because it’s this small, many drone enthusiasts prefer to use it indoors. After all the QX65 is perfectly equipped to face any walls or furniture you might hit (it has propeller guards and a durable plastic top canopy). Still, it can handle outdoor flying just as well, as long as there’s no wind and the weather is relatively nice. 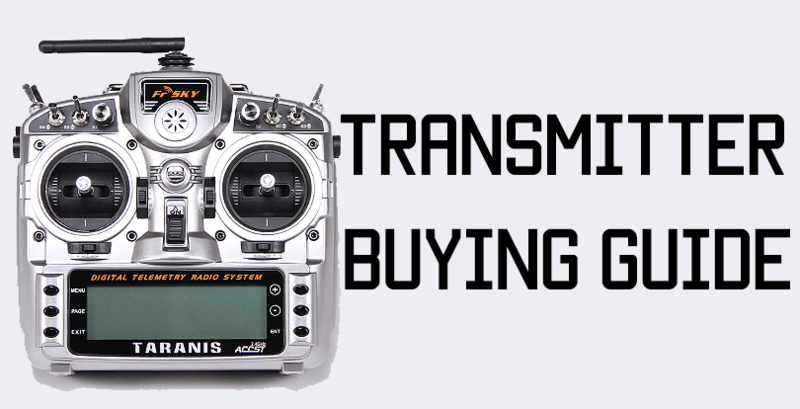 Why Should you Choose the Eachine QX65? In my opinion, the QX65 quad is quite a tiny badass. Still, you shouldn’t expect it to do anything more than it’s physically possible for a micro FPV since the board doesn’t have that much space for circuits and equipment. To clear things up on what the QX65 from Eachine can and cannot do, let’s have a closer look at the tech specs. Eachine did a fantastic job with this little quad because everything is designed with simplicity in mind! First, you have the ABS frame, which is durable and lightweight, with 31mm three-blade propellers protected by a flexible guard. The frame is also equipped with a battery holder, so you don’t have to use tape or other gimmicks to secure it in place. Next, you’ll notice the tiny plastic canopy (available in three colors) whose job is to protect the board and any electronic components. The canopy also protects the camera mount and has tiny vents that help keep the board from overheating during flight. Finally, the thing I love most about this design is the plug-and-play method used to connect the motors and the battery! Practically, whether you want to change the motors or the battery, you don’t need to wire and/or solder anything. The quad is powered by a 3.8v 250mah 30C LiPo battery (the stock version) but if you want a bit more power, I recommend using an HV 4.35v LiPo battery instead. The battery fuels four 0615 Booster coreless motors, which give the quad enough punch to make it an incredibly fun to fly drone. The motors are not screwed into the drone, but they are fitted into this built-in space into the frame’s legs, which makes any repairs or changes extremely easy. Still, I would recommend making sure they are all at the same level when you fly the drone, since the fit is not very tight, and the motors tend to climb a little bit out of the frame. As I already mentioned, the camera is mounted at the front of the drone, under the protective canopy, and its angle can be adjusted manually due to the included lens angle adjustable holder. This is a 700TVL 130degree 1/4’ CMOS camera that works with a 5.8g 48CH 25mw VTX and transmits the signal towards external devices such as screens or FPV goggles. The image quality is good, but you shouldn’t fly the quad in low-light conditions (this is not a camera for night time flying). When it comes to flying, this tiny drone is easy to control and doesn’t need any special adjustments. Moreover, because it comes fully assembled and has all the necessary accessories in the box, you can fly it right out of the box! After you bind it with a controller, of course. For this, you’ll need to reach the bind button placed under the canopy. You can do this by either unscrewing the canopy and opening it up, or by using a thin screwdriver and reaching through the vent. Furthermore, it supports three flight modes (ACRO, ANGLE, and AIR flight) and comes with the built-in Eachine Beecore V2.0 flight controller. Now, since the QX65 can change direction with ease, it’s perfect for indoor flying. Moreover, it’s fast, smooth, and agile, so it will make for a fierce competitor in an indoor race! Depending on your flying style and the type of battery used, the Eachine QX65 can give you between 2.5 and 4.5 minutes of flight time. Finally, the quad is fitted with four LED lights (2 red + 2white) so you’d know the front from the back. 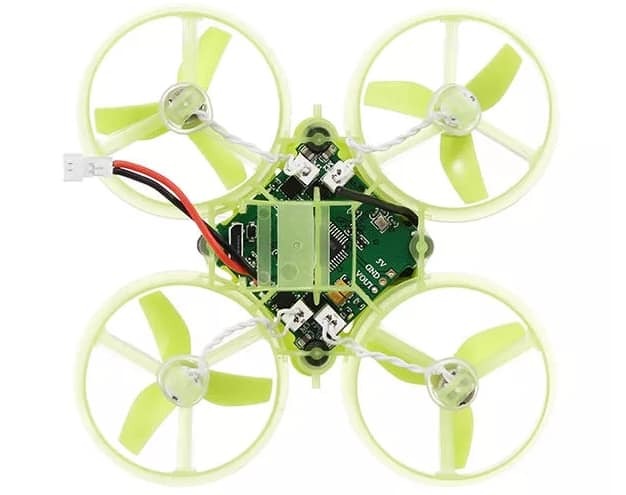 The QX65 is based on Betaflight 3.2.2 firmware and comes with an integrated F3 Flight controller with built-in Betaflight OSD (which is pretty neat for a whoop). It also supports three different 2.4G receivers (Frsky 8CH protocol D8 Mode (SBUS), Flysky 6CH AFHDS 2A protocol (IBUS), or Spektrum DSM2/DSMX protocol). 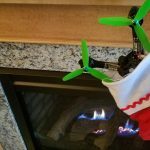 This is a cute little drone that’s a lot of fun to fly indoors and outdoors (if the weather allows it)! 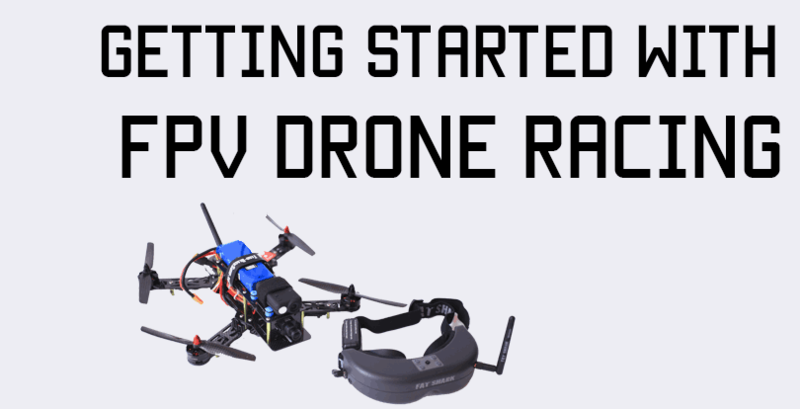 Moreover, it connects with both FPV goggles and displays (which is quite a novelty for micro drones) and behaves perfectly in indoor races. 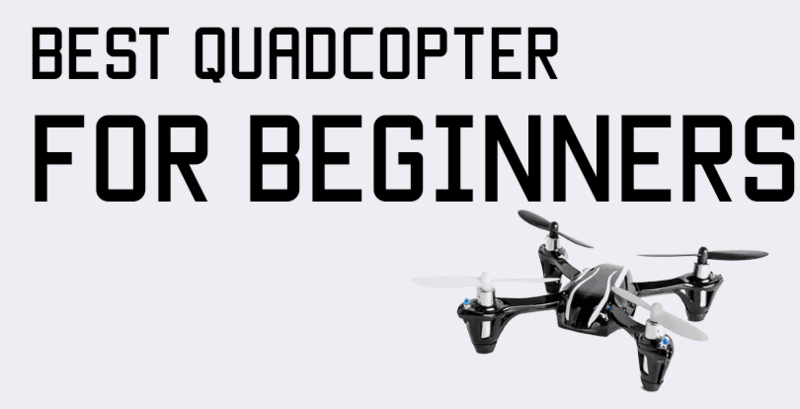 It’s easy to understand and most beginner flyers will get the hang of how to fly it rather quickly. Not to mention, parts like motors, propellers, the canopy, and even the battery can be easily replaced. 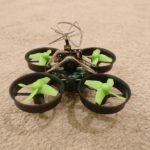 While the ABS frame and propellers are durable and flexible, I recommend getting the Advance package if the budget allows it. This way, you’ll have spare accessories and batteries to hold you for a while. This is especially important considering the fact that the port used to connect the drone with the battery (MicroJST PH 1.25mm connector) is not as common on the market. 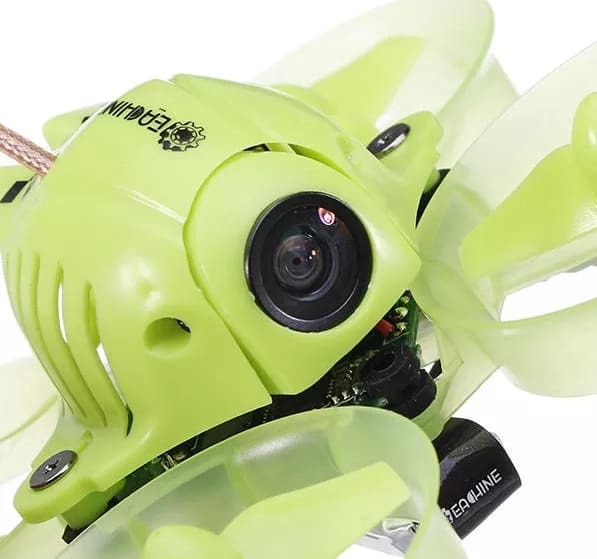 Overall, this is the perfect micro drone for FPV pilots who want to have some indoor fun!